Google has had this free service for a while now, but they are currently promoting it, trying to get lots of cities in 3D within Google Earth. It's really easy to do, and most cities likely have the data needed already. How do you get your city to participate? Who do you need to contact? Is there anyone in your local government who knows how to get this accomplished? 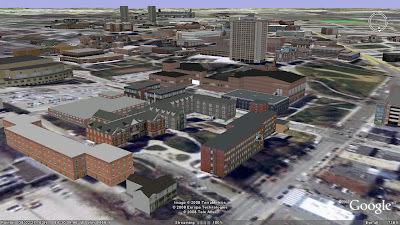 Wouldn't it be wonderful to have your entire city in 3D? Right now in Louisville, Kentucky, there are about 10 structures (of sufficient quality) that people have uploaded to the global directory, including the Humana Building, Glassworks, Slugger Field, and even Museum Plaza.